Does your organization struggle to analyze business performance everyday because it is difficult to get high quality analytics? Are you required to manually gather error-prone data to get a glimpse into business performance? Do many of your projects or initiatives lack the required analytical review to measure the impact or performance? Is your organization more reactive than proactive in its planning? Enable fully automated, easy-to-use, reliable and timely access to the required information from all your systems. Ensure your organization's efforts are focussed on growing your business. 4) make corrections as required to compensate for actual internal performance or changing external conditions. Without Business Intelligence, an organization may feel 'lost at sea', incapable of deciding where to steer and what corrections are required to get back on course. In some cases, the original destination will need to be adjusted entirely when 'weather' conditions change, making alternative opportunities more viable than original objectives. We have worked with many organizations to develop a customized, robust and timely Business Intelligence Platform. Within our website we aim to give you some ideas in what is possible with today's technology and the current mobile revolution. Information is being created, processed and consumed in vast amounts, and our goal is to make it Easier, Better and Faster for your own organization, to create and maintain a Strategic Competitive Advantage. Everyday. According to various studies of a large number of organizations, one third do not reach their revenue objectives. Additionally, one fourth of the organizations communicate revised net income figures, with average net income reductions of 42%. It is clear that these companies have budgeting and planning processes that have failed to base their performance on reliable business models. These organizations have either been incapable of establishing realistic goals from the outset, or have been incapable of reworking their operational budgets by incorporating new changing conditions. Without the appropriate level of budgetary detail, issues only become evident when they reach extremes and unavoidable failure. Under these circumstances, it is usually too late to reestablish new plans and budgets to change course, avoiding obvious icebergs or harvesting untapped opportunities. After analyzing the processes, resources and technologies used by organizations to enable their business model, we find that many have worked themselves into a situation of information islands, incapable of analyzing their actual performance in a coherent manner, let alone successfully budget for next year's business results. This situation contributes to a disjointed and uncoordinated organization, incapable of accessing one single version of the truth or working together to reach corporate-wide objectives. BIAPRO can help to provide a single Business Intelligence Platform that unifies your organization's efforts. Your organization can count on our project management methodology and expertise to ensure that your project runs smoothly. At BIAPRO, we have extensive experience in the implementation of BI for many Functional Areas and this means that you can draw from our experience to augment and better define your own requirements. 7- Profit Analysis by Products, Service Lines, Clients, Etc. It's no longer enough to get by with old and basic sales information. defining and analyzing external KPI's with respect to internal performance. Business Intelligence enables the coordination and collaboration that an organization requires across all its functions and departments. The ability to speak the same business language, focused on the key analytical dimensions gives an organization the ability to create a strategic competitive advantage that is difficult to copy by the competition, while ensuring that the whole team is "rowing" in the same direction, and thereby maximizing growth and profitability. The economic landscape is ever-more changing and competitive. Organizations find themselves with a higher level of difficulty when trying to increase sales while efficiently managing costs. However, as if immune to the hostile landscape of today's business climate, many companies are capable of achieving success by responding quickly and strategically. Their secret? They have discovered how to provide the right information, in the right format to the decision makers with perfect timing. In other words, they have implemented Business Intelligence. Everyday. 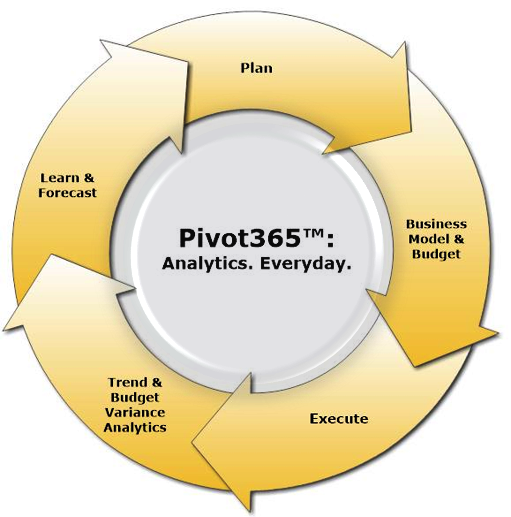 Also known as BI365 ®. The ability to differentiate between tactical and strategic opportunities (or threats) enables a company to guarantee a sustainable advantage over the medium and long terms. Many times, companies let themselves be carried away by the pull of temporary opportunities or past victories, consuming their re-sources without a clear view of the future benefits or consequences. Without the necessary information, it is near-impossible to make the right decisions, and ensure optimum results. Budgeting, Forecasting and Planning are some of the biggest Areas for Improvement in many Organizations. On many occasions an organization's budget does not reflect a complete or coherent model of the business, given a lack of the appropriate amount of detail related to business dimensions, such as business units, divisions, regions, products, markets, clients, etc. . This lack of detail is primarily due to the common practice of using single-user technologies, such as spread-sheet programs, to prepare company-wide budgets. These single-user technologies create artificial difficulties and complexity when it comes to the need to easily collaborate, consolidate, communicate and authorize the different versions of scenarios that are inherent in the tacit and highly creative process of defining a business budget. This lack of efficiency is the principal cause for the large amount of time and effort that is invested by companies in defining the final version of next year's budget, which invariably suffers from low information quality, or "guesstimates" that are not appropriately linked to the business model. If your existing budgeting and forecasting processes heavily rely on legacy Spreadsheet technologies, we can help to make them more robust and scalable. Imagine completing the budgetary cycle in a fraction of the time it takes you today. Given that many companies have their budget numbers in highly summarized form with respect to the analytics used during data capture in their everyday transactional systems, many organizations are at a loss when it comes to analyzing the most basic question of: "How was the budget accomplished (or not)?" Many budget processes incorporate a limited number of dimensions in trying to link the business model to future performance goals, and the resources necessary to achieve them. With today's use of Spreadsheet technologies to produce company-wide budget-s, the increasing need to incorporate meaningful dimensions creates a recipe for disaster when disparate files with complex formulae and disjointed coding structures have to be consolidated. For this reason, detailed budgetary information is kept to a minimum, and benefit contribution goes unchecked most of the time for the majority of products, product lines, regions, or divisions. In such a system, only extreme losses or wins are identified, leaving moderate wins to invisibly finance moderate losses. In contrast, those organizations that have the ability to budget with the necessary level of detail and can revise assumptions of the budget via periodic forecasts, have the ability to identify all winners and losers in order to take action and maximize revenue and profit, without waiting for excessive losses to indicate the existence of a problem. BIAPRO can show you how to complete your budgets and forecasts in less time with more detail, making them a key component of your planning.